The feeder vessel MV OEL Colombo owned by Orient Express Lines Fzco, Dubai became the first vessel to call at the Magampura Port Bunker Facility and take a quantity of fuel supplied by the Magampura Port Management Company, the company said on June 26 in its press release. 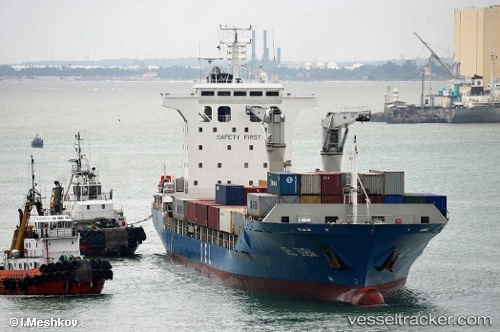 Coincidentally, the owners of the vessel named this vessel as OEL Colombo in January 2014 when they decided to dedicate this vessel to Sri Lanka considering that they have been serving Sri Lankan trade for over 20 years. Soon after President Mahinda Rajapaksa inaugurated the facility, Orient Express Lines Director Ritesh Ramakrishnan handed over a cheque to the President as payment for the inaugural supply of fuel to MV OEL Colombo. Project Minister for Highways Ports and Shipping Rohitha Abeygunawardena, Dr. Priyath Bandu Wickrema and Orient Express Lines Vice President Marius Gomez were also present. The container feeder vessel MV OEL DUBAI, with a capacity of 1,028 TEUs, entered the Ruhunu Magampura Mahinda Rajapaksa International Port recently as part of the program for the harbour pilots to familiarise themselves with the manoeuvring of vessels at the port.